why does Rachel have blood on her fingers? Don't fave this art,it is stolen! Fine. Yes it is stolen. I just unfavorited it. This Kazuha person should really stop. Great picture and it transfers the emotions of the depicted scene really well! Oh god this is in the front page now? PEOPLE SERIOUSLY STOP FAVING THIS. IT'S STOLEN ART. And it's rude and unfair towards the real artist. You should report this to da staff, not fave it. Movie 15 really made me cry. @kikibabylove15, yes it blood.She was digging in the snow, trying to find Conan.This is one of my favorite movies.And @ Skippydippi, If it's stolen,then it's stolen.You can't do anything about it.Only the person who put it up can. actually yes we can. There's that report button. And if it's stolen like in this case it is, don't just leave it be. Report it, try to find original artist, tell other it's stolen and don't fave it. This user has nothing but stolen images in her gallery and it's slowly making me mad. Cant you guys stop saying ITS STOLEN,ITS STOLEN??!! Its annoying me! And how exactly do you know that this was stolen??!! Because It IS stolen! The original is from fifi_haibara at zerochan.net! And just like wrote, probably everything is stolen in her gallery! Yep. One of her stolen drawings has the creators signature on the bottom. Fail! I guess you are right! Stupid little me.. How come I didn't think of that! Scene from movie 15 right? I luv it! Keep up the epic work!! Still, we should give the credit to the maker, not the thief. Wish i could take my comment back! If this isn't yours! Just saw the other comments! fffffuuuu! Go find you own hobbies missy! Don't steal other Deviants! 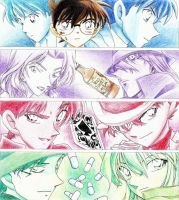 One of the best Conan fanarts ever! FAVE! why you steal so much when you don't even credit the original???? ?